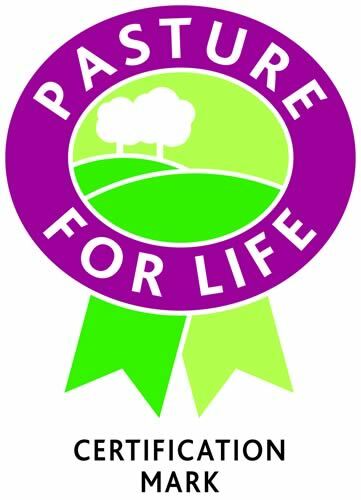 The ‘Pasture for Life’ Certification Mark, operated by the Pasture-Fed Livestock Association (PFLA), has been approved by the Intellectual Property Office (IPO), the official UK government body responsible for patents, designs and trademarks. The logo was used by certified beef and sheep farmers throughout 2015, but is now a lawful mark. The first of its kind in the UK, and possibly within Europe, this approval comes at a time of increasing demand from consumers looking for the health benefits of eating meat from animals, that have only ever had grass and pasture during their lifetime, rather than grains. “This means consumers now have an easily identifiable mark which guarantees they are buying genuine grass-fed meat,” says Anna Bassett, chair of the PFLA’s Certification Committee. The PFLA recently appointed independent inspection body Acoura to carry out farm inspections in line with the ‘Pasture for Life’ standards, which it has developed with its members. Scientific research confirms that grass-fed meat has clearly identifiable health benefits to people eating it, including lower total and saturated fat content and more good fats like Omega 3 fatty acids that can help fight disease. But these advantages are lost when even small amounts of grain are included within the diet – which is why certification for 100% grass-fed meat is so important. “Consumer interest is growing for this type of meat and some retailers are now offering grass-fed lines.” Ms. Bassett continues.